The cannabis industry has an unusual conundrum--its collective empathy and generosity extends beyond its ability to provide it. Take the recent, catastrophic fires in Northern California as an example. Industry losses are mounting and the ability for the cannabis community to rally together is strong but has limitations. 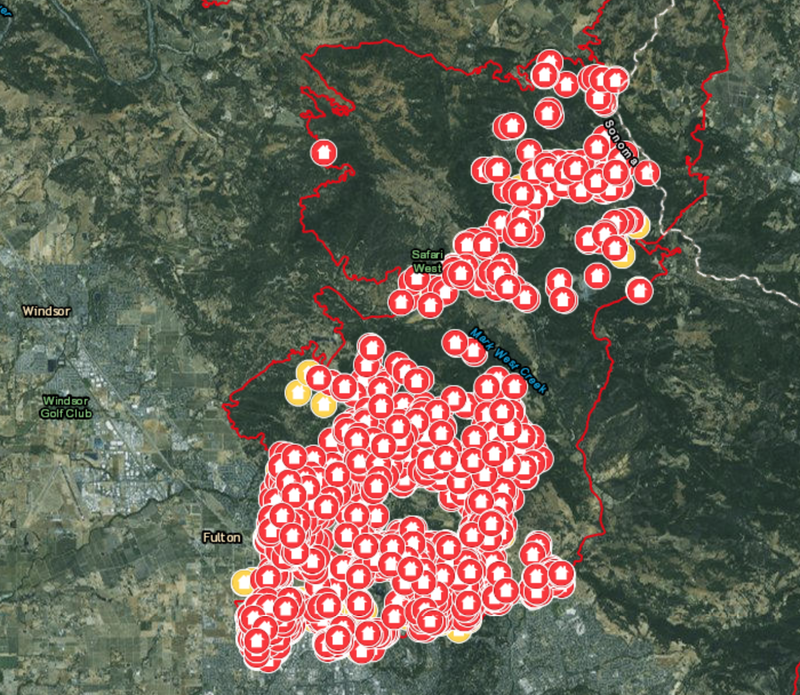 Esri, the world leader in geographical information services, has created this interactive map tracking the current known status of Northern California fire damage; Red = destroyed; Yellow = damaged. Those numbers, however, do not take into account cannabis losses. Just as Sonoma and Napa Counties have a global footprint in wine agriculture, they have a lesser-known, yet high density of cannabis farms in areas as well. These fires have created a ripple effect across the entire local and regional economies, directly impacting at least 2,000 jobs. "We estimate cannabis farmers across the affected area have lost over $40 million in product at farm prices (over $150 million in retail value),” said Daniel D'Ancona, president of California Grow Services, in a written interview. This had already been an extremely financially burdensome year for California cultivators even before the fires; efforts to move their businesses into the new compliant world claimed most of their cash-flow. California compliance costs are predicted to increase by $125,000 a year for small operations and by $310,000 a year for an average pot business. Chiah Rodriques, the CEO of Mendocino Generations, a collective of organic cannabis farmers in the county remarked, "So many of these people have literally spent their last dollar trying to get permitted." The cannabis industry isn’t in a position yet to assess the devaluation of its unburnt products due to smoke damage but anticipates it. According to the Atlantic, "A 2015 research paper by the Australian Wine Research Institute found that exposing grapes to heavy smoke for just 30 minutes was enough to produce undesirable aromas in the resulting wine." Cannabis has the same vulnerability. “Especially when it’s ripe, I can tell you from personal experience, wildfire definitely will make your cannabis have a smoky flavor to it; just like wine,” Kristin Nevedal, executive director of the International Cannabis Farmers Association told SF Gate in a September interview. Cannabis exposed to smoke and ash also has potential health risks such as lung infections. Medical cannabis users with preexisting conditions such as lung or cardiovascular disease should be particularly careful about the condition of their cannabis. Now facing an even greater financial hurdle with loss of crops (cannabis businesses don't qualify for crop insurance or federal emergency relief), they need help to make sure their businesses will survive. Farmers moved quickly to save their cannabis crop that didn't burn. Since many of the cultivating structures were burned, several companies and organizations rallied around the community offering support. California Grow Services (CGS), for example, offered storage space at their processing center in Ukiah to keep salvaged product out of the smoke for local, compliant farmers. The company is also offering complimentary business consulting, financial consulting and assistance in rebuilding plans, as well as creating a private/public plan to catalyze economic recovery, in part, through contributions from the Community Foundation of Mendocino County (CFMC). CannaCraft, Inc., a leading medical cannabis manufacturer, has donated 12,000 square feet of its office space in Santa Rosa to the American Red Cross to use as its Regional Headquarters for Northern California fire relief. Roughly 200 volunteers from all over the country are expected to occupy the space for a minimum of five weeks. Product testing company CW Analytical Laboratories and other labs are working together to establish proper experimentation and testing for contaminated plants. Hemp construction provider Hemp Technologies Collective is working with Sonoma County to certify and provide hempcrete to help buildout replacement construction. This move will help protect farmers from a similar fate in the future. On top of hempcrete being fire resistant, it is environmentally friendly and carbon negative. The Singleton Law Firm and the Law Offices of Omar Figueroa offered free assistance with FEMA claims and insurance claims. Green Rush Consulting, is providing low cost permitting and licensing application services to farmers who have, for decades, been the backbone of the cannabis industry. The organization has been meeting with state Senator Mike McGuire and other key industry organizations to reach their constituents and drive outreach. Chris Sayegh, owner and head chef of The Herbal Chef, and Susan Soares, executive director of C.A.R.E., a non-profit organization dedicated to cannabis advocacy, rallies and events, are hosting an “End of Prohibition” New Year’s cannabis pairing dinner and party in Long Beach supporting the Northern California cannabis fire victims (for details and information contact Susan@JustSayCARE.org. In Oakland, a quick-thinking group of activists and event organizers at New West Summit organized an impromptu, fundraising raffle. Well over 100 conference vendors donated everything from vaporizers, high-end vape units, to whole flour and manufactured products to the cause, generating $12,000 in two days. Jim McAlpine, New West’s executive director, knows the pain of loss first-hand. His parents’ house burned down in the fires. Part of this effort was a You Care crowdfunding campaign for fire victims of all sorts, that was later shut down. 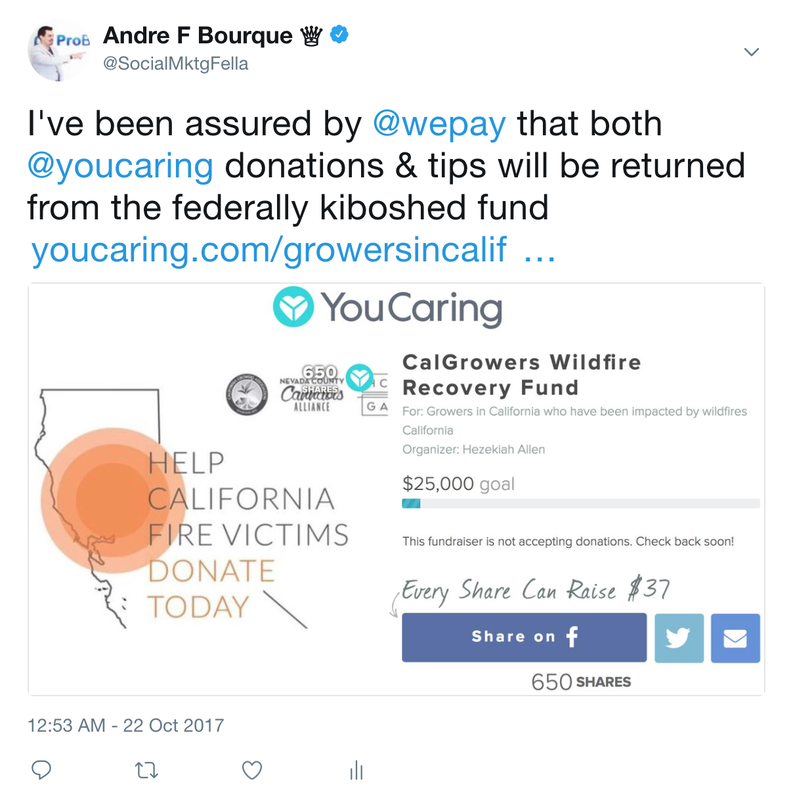 In a written exchange with the crowdfunding platform, I was told YouCaring supports all forms of treatment and most disaster relief fundraiser types. Jeremy Milk, head of marketing at WePay, said that to comply with federal law "and related government notices, and requirements from our bank and credit card company partners, WePay does not process payments related to marijuana." How will all this affect cannabis prices? It depends on whom you ask. “The market might see price increases were there were only a few suppliers, but given how many suppliers there are, and given how each retailer has their own micro-supply chain (localized, relationship-based suppliers), the likelihood of an entire market experiencing a price increase is extremely remote,” Beau Whitney, senior economist at New Frontier Data argues. “It’s a drop in the bucket compared to what the state is producing,” Erich Pearson, the CEO of Sparc, a San Francisco-area medical marijuana chain that lost its farm in the fire, told Marijuna Business Daily. Alternatively, Tamar Maritz, regional director for California at marijuana data insights company BDS Analytics, said Californians could expect to see prices rise as much as 10 percent to 20 percent in the aftermath of the fires. The company found precedent in regulatory changes that shorted supply to the debut of recreational markets in Colorado, Washington and Oregon where a "major disruption in the supply chain" created price increases of the same magnitude. Cannabis industry losses from the Northern California fires are widespread and unprecedented. It will certainly take years for communities to recover. But the process of getting there will be a uniquely collaborative one given the industry’s collective reverence for the plant and organizational respect for one another. “Ensure that not a single grower fails to get a license because of wildfire-related hardship,” the mission statement of the California Growers Association wildfire recovery fund reads. That declaration has special meaing in the cannabis industry, which already has generations of proven resilience behind it.